It was a bright sunny afternoon around 10 degrees. 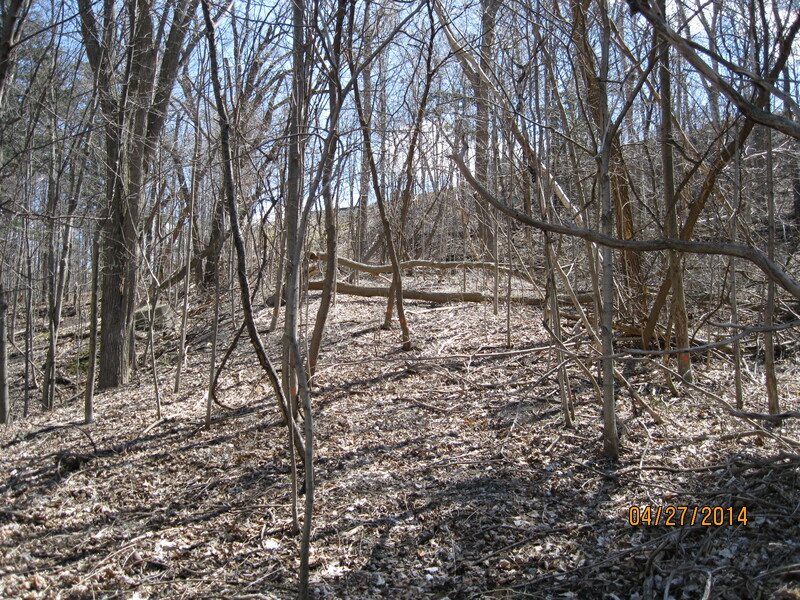 I entered the woods at the east end of the Eglinton Ave. bridge over the East Don River. As you go into the south east you come quickly to the first storm drain. 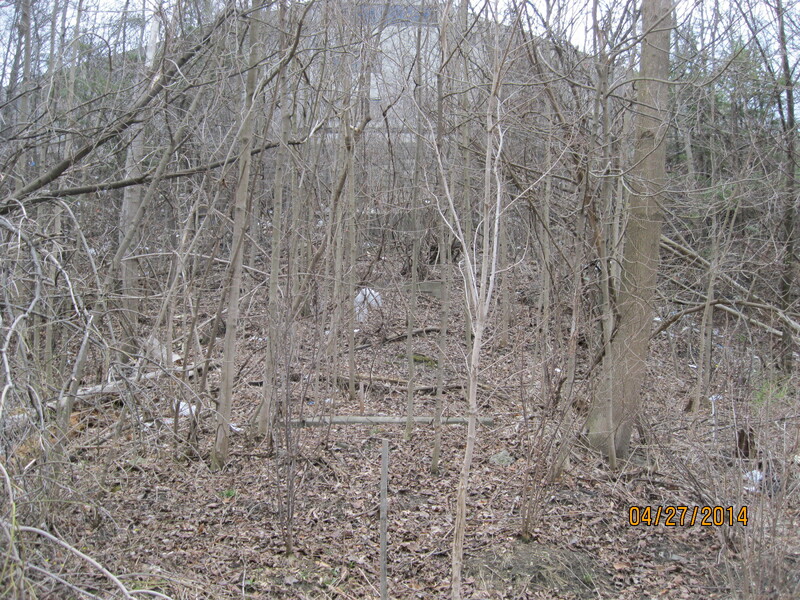 Cross above the drain and make your way through the cedar woods towards the bottom of the hill and the CPR tracks. After skirting the edge of the hill for a short while you will come across a ramp coming down the hillside. This is the end of Old Eglinton Road when it used to come down the hill and out to the railroad tracks as recently as the 1970’s. 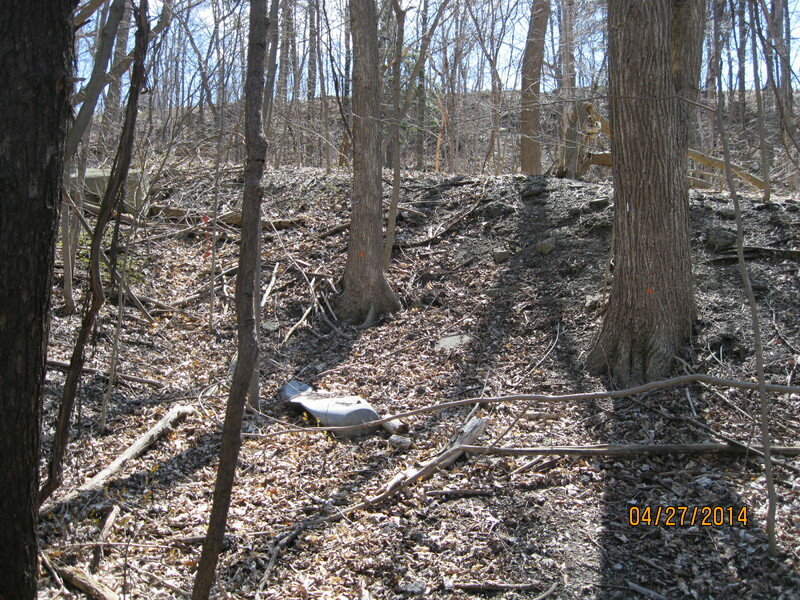 There is some garbage along the north side of the roadway but nothing to specifically date the rubbish. Lots of Ketchup bottles but unfortunately Heinz never took to dating their bottles. Following the trail a little further brings you to a small stream that disappears under the railroad tracks and runs under the golf course to the East Don River. If you take the trail away from the tracks and midway along the side of the hill you will come to a place to cross the stream where it flows out of a large culvert. Crossing the culvert and turning to your right you will find a set of five footings from an old bridge. The footings on the north side have been broken up, but still remain. I disturbed a pair of cardinals who likely have a nest here. As usual they’re a little camera shy and don’t sit still long enough to get their picture taken. 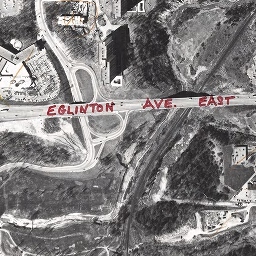 Old Eglinton Road as seen in this 1971 aerial photo. The road can be seen cutting through the trees in the lower right hand corner. The new Eglinton Ave is marked where it runs a couple hundred meters north of the old road. The north side of the bottom end of Old Eglinton Road as it descends the hill. Looking up the hill on Old Eglinton road the trees are well established. Hiking by myself, I decided not to try this bridge. There is a little trail that will lead you up and around. Hiding in the trees and leading straight up the hill into the side of a building are five concrete supports for a bridge. As of this writing I can’t find anything on them. 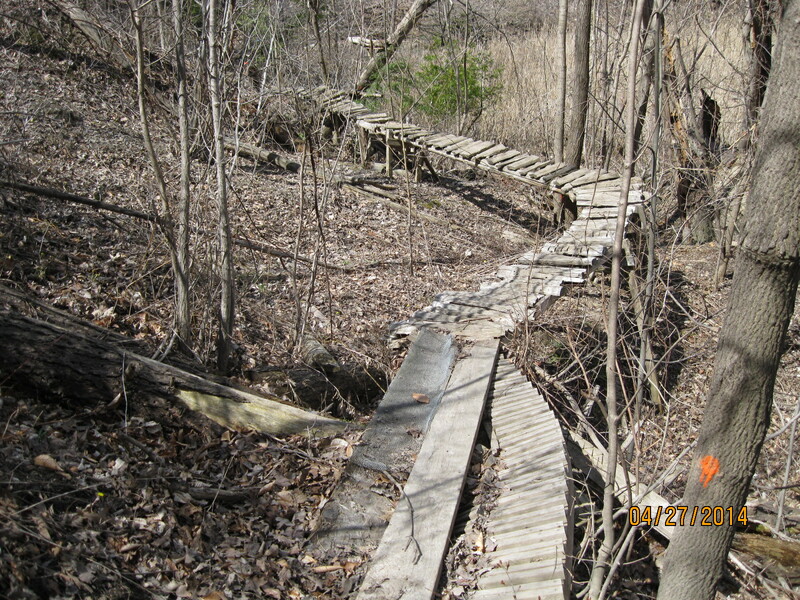 This entry was posted in Don River, Hiking GTA, Uncategorized and tagged Don River on April 28, 2014 by hikingthegta. Is this at the bottom of what’s now called old Eglinton Ave? Or is it at the bottom of the access road under the power towers just south of it? At the bottom of Old Eglinton. Ahh right on. Any idea if the service road that winds down under the hydro towers had any other purpose but being a hydro service road? From the old aerial photos it appears to arrive with the power line.